I came to the Convention as a middle-aged female Obama delegate eager to make peace with Hillary women, and I did not get off to a good start. Along with my stack of convention-week party invitations, I’d gotten a letter from NARAL asking delegates to sign an “I’m a Pro-Choice Delegate” pledge, and looking for volunteers to be Pro-Choice Whips in their delegation. One of the Pro-Choice whip’s duties would be handing out the “Yes We Can!” can at Monday’s breakfast: a cute little piece of Convention chum containing a “Yes We Can! Opener,” and a “Pro-Choice, Pro-Obama” button. I stationed myself by the door of our delegation breakfast room on Monday morning and doled out the cans to delegates happy to support reproductive rights and load up on more freebies. But one Hillary stalwart read the label and shoved the can right back at me. “I don’t want anything from NARAL,” she said. “And you should be ashamed of yourself for endorsing him.” Yikes. I’d forgotten that NARAL had infuriated some Clinton supporters by endorsing Obama during the primaries. 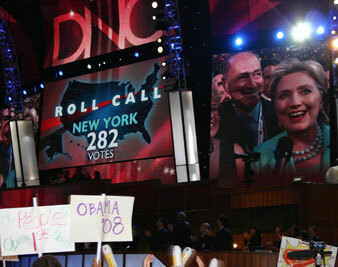 Monday night I watched several clusters of well-heeled, stone-faced Hillary supporters in our delegation who didn’t wave the Obama signs our floor whips distributed, who didn’t rise and applaud when Nancy Pelosi, or Caroline Kennedy or even Ted Kennedy hailed the prospect of an Obama Administration. But when lovely little Sasha and Malia Obama reached for the mic after their mother’s speech to say, “I love you Daddy,” these women smiled, and strained for a better view. Maybe, I thought, this convention will work, after all. We are the generation for whom the personal became the political, and now we are living through a moment in which the political became personal. This week in Denver, doing political work has felt like doing emotional work. I’m here as a first-time delegate from a swing district in southeastern Pennsylvania. I’m an antiwar activist and was a Deaniac in 2004. I first heard about Barack Obama in summer of 2004, when Howard Dean recommended him as part of his “Dean Dozen”–progressive candidates Dean backed after he dropped out of the presidential race. I was surprised to be put on the delegate slate alongside party regulars, office holders, candidates, donors and fundraisers. “We wanted some grassroots people,” someone involved with the selection process told me the day that Senator Clinton conceded the nomination in June, “because until today, we didn’t know if we’d have a floor fight, and we knew that the grassroots types would fall on their swords for Obama.” During the long primary campaign in Pennsylvania, I promised Obama supporters that I would vote for our candidate at the convention no matter what, and so, as the convention approached I sympathized with the Clinton supporters petitioning for a roll call vote: if I’d been in their shoes, I’d have wanted a roll call vote too. Voting in our delegation began Wednesday morning. At breakfast Ed Rendell said, “If you are a Clinton delegate and you feel that you must vote for Senator Clinton to bring closure I understand that–but it would give me great pleasure to be able to say that following the instructions of Sen. Clinton the great state of Pennsylvania casts all its votes for Sen. Obama.” My county party chair, a Clinton delegate, was the first of our delegation to vote at the polling station in our hotel, and he voted for Obama. Delegates could change their votes up until the moment the state cast its votes on the convention floor, and throughout the afternoon, Ed Rendell was out there, cajoling and charming delegates, working for unanimity. When New Hampshire cast all its votes for Obama, the convention went wild. Meanwhile one of our Clinton delegates, Jo Ellen Litz of Lebanon, Pennsylvania sat with a tally sheet, adding up the Clinton and Obama votes as each state announced its totals. “How did you vote?” I whispered. “How do you think?” she said, sweetly. “Did anyone pressure you to switch?” I asked her. “I kept to myself today,” she said. Cynthia BaughmanCynthia Baughman is a freelance writer who lives on a farm in Douglassville, PA. She wrote about the legal status of pledged delegates for Slate.com in April, and is working a documentary film, Top Secret Rosies: the Female 'Computers' Who Helped Win World War II, about the programmers of ENIAC, the world's first computer.